Look out for products which are described as ‘balms, lipstick balms, glazes or sheer lipsticks’. These types of products can help you get used to wearing red in a more natural and muted fashion. 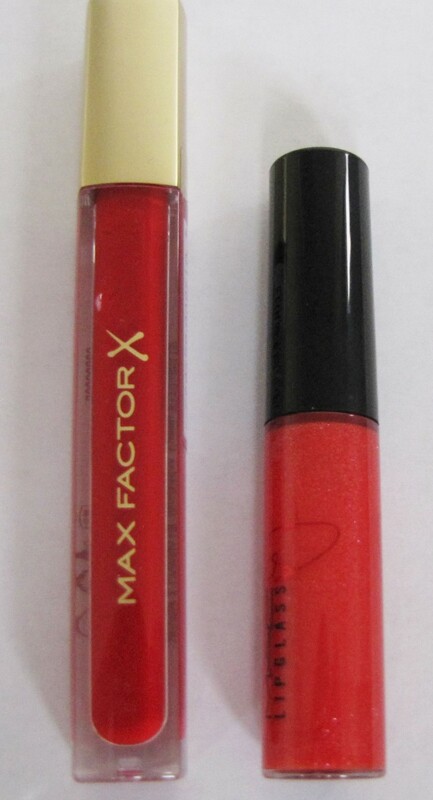 Products to look out for: Max Factor’s Colour Intensifying Balm in ‘Luscious Red’ is great for if you want just a very subtle hint of red on the lips (see below). Vaseline Lip Therapy Rosy Lips’ is lip balm with a slight red tint and even more natural than the MF Balm. 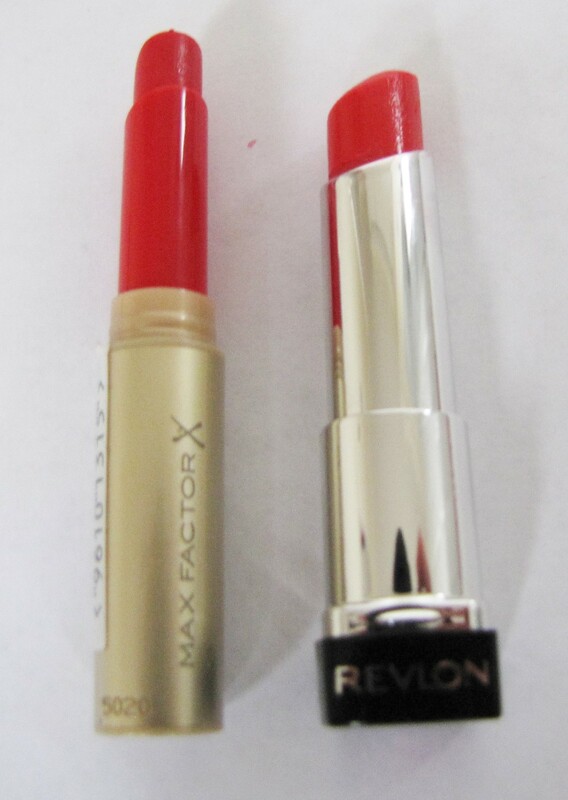 More products to Look out for: Revlon Colourburst Lip Butter in ‘063 Wild Watermelon’ (see below) and MAC Huggable Lip Colour in ‘Cherry Glaze’ (see below) give lips a little more colour but still keep the overall effect very natural and soft. Loreal Rouge Caresse Lipstick in 401 Rebel Red is another sheer red lip colour worth checking out. A sheer red lipgloss will give a slight red tint to the lips, as well as making lips look juicier and fuller. Products to try: Max Factor Colour Elixir Lip Gloss in ’30 Captivating Ruby’ coats lips in a smooth, glossy red tint (see below). MAC Lipglass in ‘Viva Glam Miley Cyrus 2’ is extremely natural and gives lips a slight orangey-red, see-through shimmery sheen (see below). MAC Lip Glass in ‘Venetian’ is another beautiful, very sheer red lip gloss. Many brands now stock lipsticks in pencil form. Ones which are marked as ‘stains’, ‘balms’ or ‘glosses’ can be quite subtle on the lips and provide a hint of colour. I particularly like using lip stain pencils when I am on holiday, as they are lower maintenance and give a softer effect to the lips. Products to look out for: One of my favourite products is Revlon’s Just Bitten Kissable Lip Stain in ‘045 Romantic’ (see below). The Revlon stains have a slight minty taste, are long-lasting and moisturise the lips. Other pencils worth checking out include: Bourjois Paris Colourboost Lip Crayon in ‘Red Sunshine’ and ‘Red Island’; Loreal Glam Shine Balmy Gloss in ‘Bite the Marajuca’; and Rimmel London Colour Rush Balm in ‘The Redder the Better’ and ‘On Fire’. Here are some swatches of the products described above. Note that I have swatched these on white paper, rather than lips. I did this as people will have very different skin tones, so this shows what the colours look like on a plain canvas. The shades will look more muted over lips. Get a red lipstick in a colour that you would love to wear – but maybe don’t feel totally confident in wearing yet – and apply one layer of lipstick. Take a tissue and blot the lipstick until you have a stain in a hue that you feel more comfortable with. This technique can help you get used to wearing a bolder colour. As you get used to wearing red this way, you can build the shade up a bit more and blot less. You can also mix your chosen red lipstick with a little lip balm to give you a softer effect until you get used to wearing the lipstick on its own. Apply lipbalm to your lips and then apply a little red lipstick over the top. Alternatively, apply a little lipbalm to the back of your hand, top with some red lipstick, then mix together and ‘dab’ lightly on to your lips. Both of these techniques will give you a softer, sheerer red finish.